Neurogenic T-Waves. This patient has a large subdural hemorrhage with midline shift. Brain injury can cause numerous effects on the body. One effect that is often not considered is the myocardial response. The ECG above demonstrates deep, inverted T-waves also known as “cerebral” or “neurogenic” T-waves. Brain injury related EKG abnormalities are particularly common after subarachnoid hemorrhage, where they are reported in 49–100% of cases. However, these changes can also be seen in massive ischemic stroke (such as with an MCA infarct) and other causes of elevated intracranial pressure. These changes are usually seen in patients with significant neurologic injury. The most common EKG abnormalities seen in traumatic brain injury and CNS events are diffuse deep T-wave inversions, non-specific ST changes, brady-dysrhythmias (Cushing’s reflex), tachy-dysrhythmias, and prolongation of the QTc. The mechanism of these abnormalities is unknown, but studies suggest that the neurologic injury causes a surge of circulating and local myocardial catecholamines. This can lead to coronary vasoconstriction, stunned myocardium, and a neuro-inflammatory response. Neurogenic cardiac abnormalities are usually transient, and treatment should be directed at brain injury. 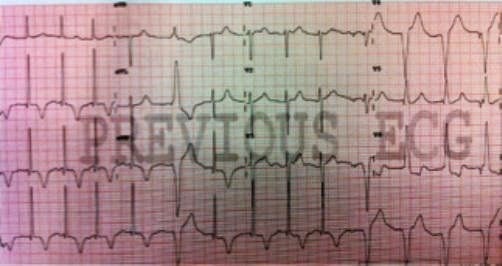 It is important to consider the other etiologies of T-wave inversions such as ischemia, electrolyte abnormalities, and hypothermia. There are often multiple etiologies for the origin of an abnormality seen on ECG, and it is important to have a broad differential. Always remember to treat the patient and not the test result. 3. Tokgozoglu SL, Batur MK, Topcuoglu MA, Saribas O, et al. Effects of stroke localization on cardiac autonomic balance and sudden death. Stroke. 1999;30:1307–11.